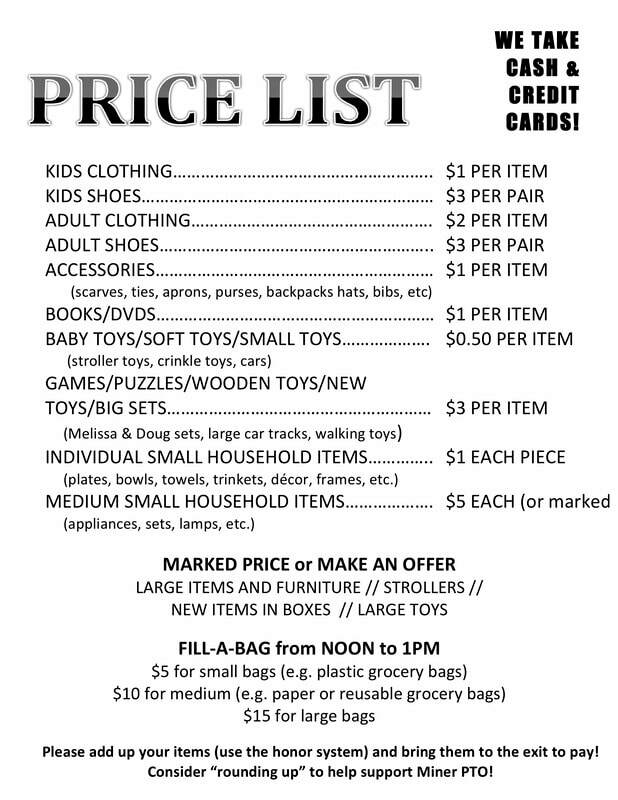 The Miner Elementary School Parent Teacher Organization invites you to our Fourth Annual Community Yard Sale! ​We have clothing for adults, kids, and infants / baby gear / furniture, housewares & decor / toys & games, and more! Cash and credit cards accepted. All proceeds from the sale will go into the general fund of the Miner PTO, a 501(c)3 charitable organization. ​Information on how to donate, as well as our e-waste and hazardous waste collection service, is at the bottom of the page. Interested in volunteering to help out with the sale? You can help set up for the sale the day before (Friday, March 8) or volunteer during the sale (Saturday, March 9). You can even choose which activity you want to volunteer to do! Add your name to a time slot and task on the sign up page for set up and day of sale activities. 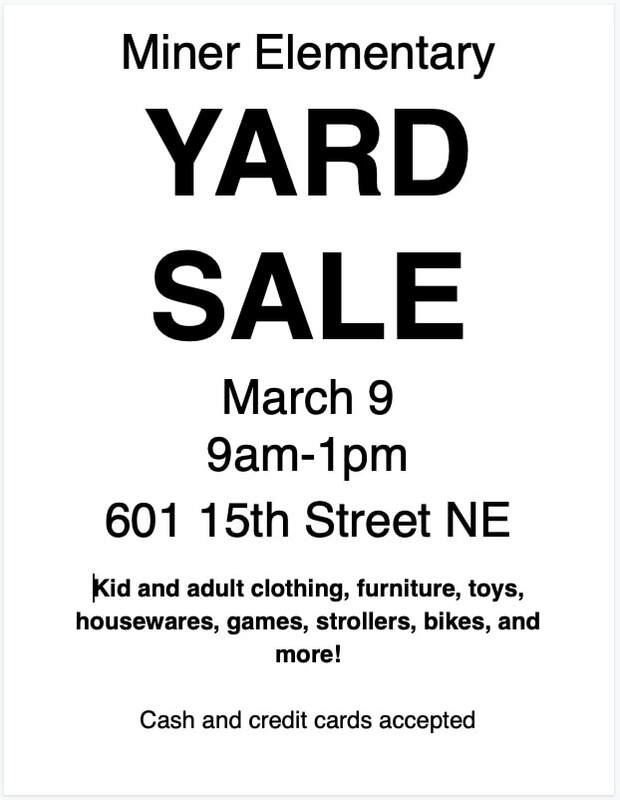 You can help distribute flyers in the community during the week leading up to the yard sale. Sign up here for flyer distribution. You can donate baked goods or beverages to be sold at the yard sale. Sign up here to donate baked goods. ​If you're not able to participate in the Yard Sale but would still like to make a financial contribution, please visit our Donate webpage. Click either image below to download the file. ​Let the security guard at the entry desk know you're there to drop off donations. LARGE ITEMS: Due to space constraints, we cannot accept donations of furniture and other large items until the week of March 4! If you would like a donation receipt for tax purposes, please email us at minerpto@gmail.com. ​WE'RE ALSO ACCEPTING HAZARDOUS WASTE and E-WASTE ON THE MORNING OF THE SALE - FROM 9:00 AM UNTIL NOON ONLY. Time to clean out your storage area or garage of paint, chemicals, old electronics and other items not fit to go into a landfill. We'll have an area set aside to collect these items for transport up to the Fort Totten Transfer Station for proper disposal.